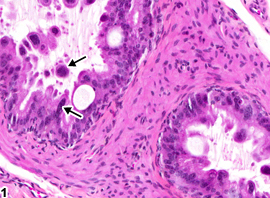 Epididymis, Epithelium - Karyomegaly. 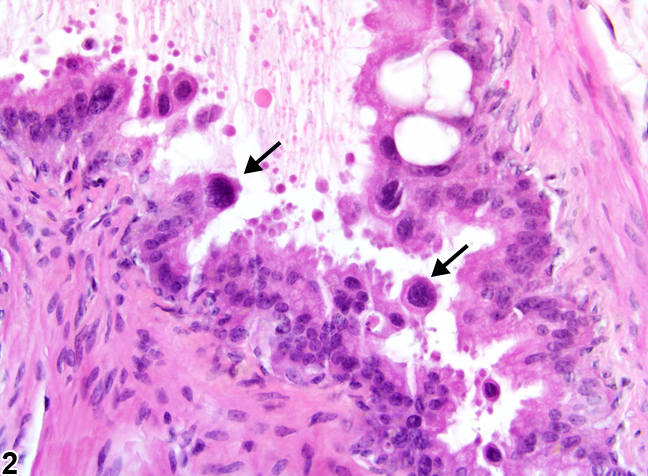 Atypical enlarged nuclei (arrows) in the epididymal epithelium in a male B6C3F1 mouse from a chronic study. 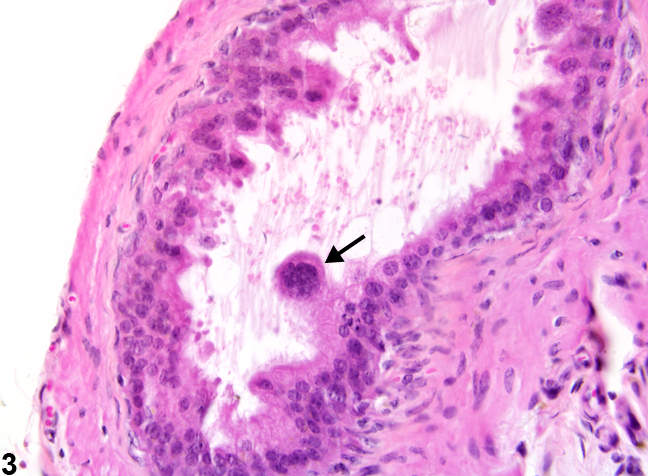 Epididymis, Epithelium - Karyomegaly. Multiple enlarge nuclei (arrows) in the epididymis in a B6C3F1 mouse from a chronic study. 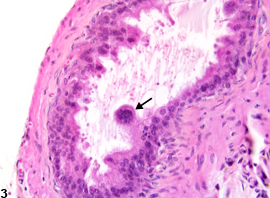 Epididymis, Epithelium - Karyomegaly. A karyomegalic nucleus (arrow) is projecting into the duct lumen in a B6C3F1 mouse from a chronic study. Atypical enlarged nuclei (karyomegaly) are most often seen in the epithelium of the ductus deferens, but can also be seen in other parts of the epididymis. Karyomegaly is characterized by epithelial cells that contain large, intensely basophilic staining nuclei that are often indented. It is generally seen as a background finding in mice. There is no evidence that this cell atypia progresses or is preneoplastic. Karyomegaly should be recorded and graded and should be discussed in the pathology narrative if the incidence and/or severity appears to be related to chemical administration. Indication of bilateral should be provided if appropriate. Correlation with disturbances in other male reproductive organs is recommended to aid interpretation.